Summer vacationing doesn’t have to mean burning a half-dozen tanks of gas and wandering through unfamiliar states. You can leave the corn fields of Champaign-Urbana behind for a night or two because our state has more to offer than you may even realize. There truly is a vacation for all budgets and all interests. 1. All Things Abe in Springfield: The State Capital has plenty to offer for a family vacation. While the Abraham Lincoln Presidential Library and Museum is a popular spot to visit while vacationing in the area, the Illinois State Museum is not to be overlooked. Children will love the Play Museum featured on the lower level and parents will enjoy that admission to the museum is free through age 18. Expect the highest crowds of the year if you visit Springfield during the Illinois State Fair in August. You can also visit the Henson Robinson Zoo, and don’t forget to try Springfield’s signature sandwich, the horseshoe, while you’re in town. 2. Rides and More in Gurnee: Home of Six Flags Great America, Gurnee is proudly opening a new Great Wolf Lodge this summer where Key Lime Cove used to be. Combine the two together for an epic theme park/waterpark vacation. When you stay in Gurnee overnight you may consider two or more days at Great America to cover it all, making a season pass a decent option for your vacation. If you go at least two days and buy four or more passes for your family, it is worth it to get the season pass! Gurnee Mills is an outlet mall you could easily spend an entire day at, or at minimum, find a wide variety of affordable dining options outside of the park. 3. Play Time in Peoria: Sometimes all you need is a different kids museum and outdoor spaces to run and play to enjoy a vacation close to home. The Peoria PlayHouse Children’s Museum shares a parking lot with the Peoria Zoo and between the two, your family could stay busy for hours. Don’t miss the expansive sand play area on the porch of the PlayHouse while you’re there (they even have vacuums to get some of the sand off your kids when you’re done). While the Peoria Riverfront Museum may not appeal to younger children much, there’s a giant screen theater sure to impress big kids and adults. Take in a Peoria Chiefs baseball game while you’re in town or catch some live music at one of the locations along the Riverfront. 4. Scenic Adventures Await in Galena: This town is definitely in the running for the most picturesque small town in our state. If you enjoy strolling hilly streets through a small town, dining in unique non-chain restaurants and staying in a cabin or bed and breakfast, your family may love Galena (hotel and resort options available too). There are lots of great outdoor activity options like horseback riding and canoe rentals and you’ll love the artsy vibe of this community. Wineries, breweries and distilleries are also popular, so if you’re traveling with other families or multiple adults, perhaps your group will split up for a bit and have a girls’ or guys’ night at one of these unique establishments. 6. 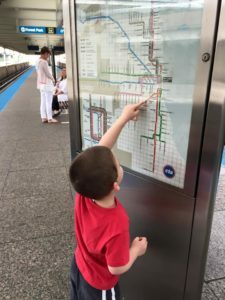 Skip Downtown Chicago and Visit the Suburbs: You don’t have to stay downtown to enjoy the outskirts of Chicago! Stay in the northwest suburb of Schaumburg to take advantage of great opportunities to shop, cheer on knights at Medieval Times or play for hours at Gameworks. Or stay in the North Shore area and you can visit Ravinia Festival for an outdoor concert as a family or the North Shore beaches, all without the buzz of Downtown Chicago (read our article on a North Shore trip here). 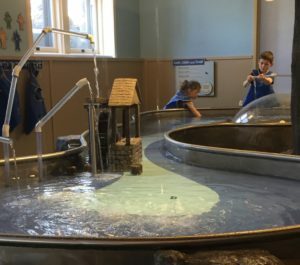 Children’s museums and outdoor waterparks (often connected to that suburb’s park district) are all throughout the suburbs to round out your trip. For more info on family-friendly happenings in these two areas, check out our friends at Little Lake County and kidlist. 7. Chase some Waterfalls at the Shawnee National Forest: If you’re looking for waterfalls in Illinois, you need to get your kids’ picture along one of their designated waterfall trails. Families with older children especially will enjoy a hike through Garden of the Gods, where stunning bluffs provide more great views. Lodging opportunities are going to be sparse in this area, so if you’re not campers, be prepared for a short 20-30-minute drive towards Carbondale for some hotels. 8. 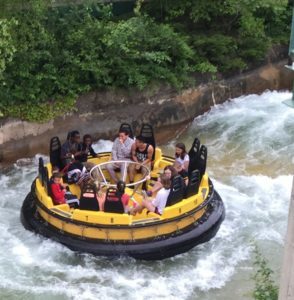 Rock the Waves in Rockford: The main summer attraction in Rockford is the famous Magic Waters waterpark, which is the largest outdoor waterpark we think you can find in the area without driving all the way to Wisconsin Dells. Plan at least a full day to hit all the rides. You can also visit the Burpee Museum of Natural History or Volcano Falls for all the go-karting, mini-golfing, laser-tagging you can handle. We hear the Anderson Japanese Gardens are impressive to walk through, too. 9. Relax at Starved Rock: Maybe the most well-known Illinois state park can be found at Starved Rock. Located between Bloomington and Rockford, the drive isn’t terribly farm from C-U and the canyons, waterfalls and scenic river views are always impressive. Nearby towns of Utica, Oglesby and Peru all offer places to stay. 10. Explore Cahokia Mounds as a Family: The remains of the most sophisticated prehistoric native civilization north of Mexico are preserved at Cahokia Mounds State Historic Site. Aspiring archaeologists will soak up the history Cahokia Mounds has to offer and you should allow ample time to explore the grounds as well as the museum/interpretive center. This is located in Collinsville, which is considered part of the Metro East region of St. Louis. 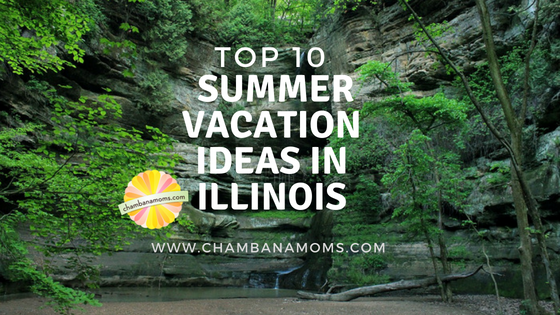 Do you have a favorite Illinois destination not covered below? Leave us a comment of where we should cover next in our travel series! Want more summer family fun ideas? Sign up for our weekly e-newsletter, it’s FREE!